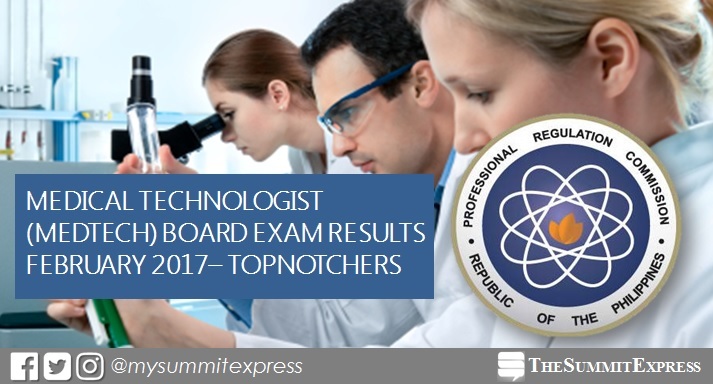 MANILA, Philippines - Vanessa Leslie Rivera topped the February 2017 Medical Technologist (Medtech) board exam, the Professional Regulation Commission (PRC) announced on Thursday, March 2. Rivera, graduate from Far Eastern University (FEU) - Manila garnered 91.20-percent grade. A total of 2,378 out of 3,216 passed the Medtech board exam, according to PRC. Meanwhile, David Marco Abaya Bildan from Saint Louis University (SLU) ranked second with 90.60%.